Our well stocked chandlery provides a variety of boat parts, products for repairs and necessities for boat maintenance and improving your boat. We stock many leading marine brands. Our experienced staff can offer you personal service, product knowledge and advice. We continually monitor competition reviewing our prices regularly, we offer our customers seasonal promotions, to ensure we offer great value for money, supported with after sale care and product guarantees. We hold stock of a selection of English Braid Rope, shock cord and twine. All our products can be cut professionally with heated cutter preventing fraying. Stocking Hempel antifoul and paint, International and Sikkens products. Primers, enamels, two-pack paint, deck & bilge paint, outdrive and waterline paint and selected antifouls. Extensive range of brands, Starbrite cleaners, Farecla compounds and mops, 3M maintenance products, Hempels cleaner. Marine fillers, Epoxy & gel-coat. 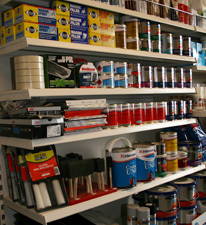 We also have a wide range of preparation products you’ll need from wet & dry, brushes, masking tape, rollers and much more all at excellent prices. A range of 12v and shore power products. A Full range of batteries & accessories. Battery management systems. Outboard motor service kits. Selections of fuel and oil filters. Enfield bellows & clips. Volvo penta Parts. Magnesium anodes, marine grease, fuel additives and much more. Hoses and clips. Water pumps and Filters. Jabsco repairs kits. Aqua Kem, toilet cleaners and lubricators. Water purification products. Fire Extinguishers, Fire bankets, fenders, boat hooks, mooring stakes and lock keys. We can supply a wide range of Aluminium fendering and PVC inserts. We can offer an array of coloured vinyl’s, also available with foam backing, with no minimum order. PVC window insert. Just a small selection of the many brands & products we supply & stock, if you can’t find what you’re looking for please contact us by calling 01480 472763 or fill in our contact form. 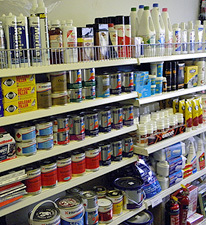 Well stocked marine chandlery with many boat parts, paints and essentials.